Based on a new report from the Congressional Budget Office, I wrote two weeks ago about America’s dismal long-run fiscal outlook. Simply stated, we face a Greek-style fiscal future because of changing demographics and poorly designed entitlement programs. But I was just looking at big-picture fiscal aggregates. And while that was discouraging, it gets downright depressing when you look behind the numbers and consider how a growing share of Americans are getting lured into government dependency. Nicholas Eberstadt of the American Enterprise Institute has a very grim analysis on the growth of entitlement dependency in the United States. The American welfare state today transfers over 14% of the nation’s GDP to the recipients of its many programs, and over a third of the population now accepts “need-based” benefits from the government. This is not the America that Tocqueville encountered. The article looks at the history of the welfare state in America. In 1961, at the start of the Kennedy Administration, total government entitlement transfers to individual recipients accounted for a little less than 5% of GDP, as opposed to 2.5% of GDP in 1931 just before the New Deal. In 1963 — the year of Kennedy’s assassination — these entitlement transfers accounted for about 6% of total personal income. But things began to deteriorate under LBJ. And guess what? Once we started rewarding dependency, more and more people decided they were entitled. Over the half-century between 1963 and 2013, entitlement transfers were the fastest growing source of personal income in America — expanding at twice the rate for real per capita personal income from all other sources, in fact. Relentless, exponential growth of entitlement payments recast the American family budget over the course of just two generations. In 1963, these transfers accounted for less than one out of every 15 dollars of overall personal income; by 2013, they accounted for more than one dollar out of every six. The explosive growth of entitlement outlays, of course, was accompanied by a corresponding surge in the number of Americans who would routinely apply for, and accept, such government benefits. And how many people have been lured into government dependency? 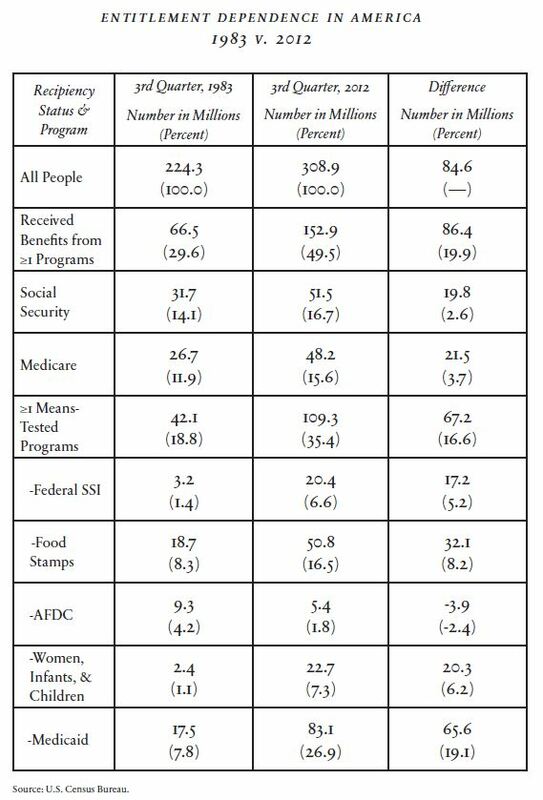 A lot, and mostly because of welfare spending rather than age-related social insurance programs such as Social Security and Medicare. …the government did not actually begin systematically tracking the demographics of America’s “program participation” until a generation ago. Such data as are available, however, depict a sea change over the past 30 years. …By 2012, the most recent year for such figures at this writing, Census Bureau estimates indicated that more than 150 million Americans, or a little more than 49% of the population, lived in households that received at least one entitlement benefit….Between 1983 and 2012, by Census Bureau estimates, the percentage of Americans “participating” in entitlement programs jumped by nearly 20 percentage points….Less than one-fifth of that 20-percentage-point jump can be attributed to increased reliance on these two “old age” programs. Overwhelmingly, the growth in claimants of entitlement benefits has stemmed from an extraordinary rise in “means-tested” entitlements. Ugh. I’ve previously written that getting something from the government doesn’t automatically turn somebody into a moocher or a deadbeat. Nonetheless, it can’t be good news that 49 percent of U.S. households are on the receiving end for goodies from Uncle Sam. Here’s a table from his article that should frighten anyone who thinks work and self-reliance are worthwhile values. There’s lot of information, so I recommend just focusing on the numbers in parentheses in the first two columns. Those show how dependency is increasing by significant amounts for many programs. Eberstadt highlights some of the worst numbers, most notably the huge growth in food stamps and Medicaid dependency. …the rolls of claimants receiving food stamps (a program that was officially rebranded the Supplemental Nutrition Assistance Program, or SNAP, in 2008 because of the stigma the phrase had acquired) jumped from 19 million to 51 million. By 2012 almost one American in six lived in a home enrolled in the SNAP program. 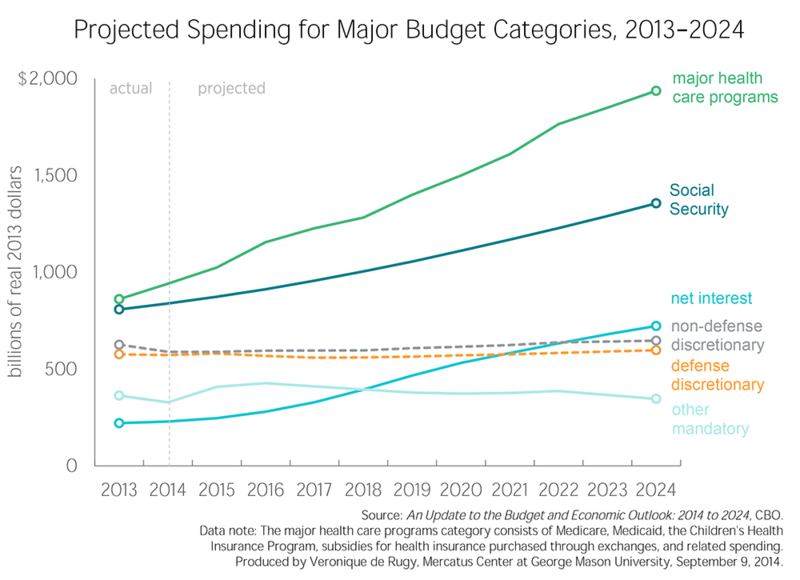 The ranks of Medicaid, the means-tested national health-care program, increased by over 65 million between 1983 and 2012, and now include over one in four Americans. …Between 1983 and 2012, the number of Americans in households receiving Federal SSI more than sextupled; by 2012, over 20 million people were counted as dependents of the program. As bad as these numbers are, the most worrisome part of the article is when Eberstadt writes about the erosion of America’s cultural capital. And the erosion of cultural capital is very difficult to reverse, thanks in large part to the welfare-aided erosion of traditional families and falling levels of work among males. The corrosive nature of mass dependence on entitlements is evident from the nature of the pathologies so closely associated with its spread. Two of the most pernicious of them are so tightly intertwined as to be inseparable: the breakdown of the pre-existing American family structure and the dramatic decrease in participation in work among working-age men. …the rise of long-term entitlement dependence — with the concomitant “mainstreaming” of inter-generational welfare dependence — self-evidently delivers a heavy blow. Since this has been an utterly depressing analysis so far, let’s close with a vaguely optimistic look at the future. While it may not be easy to reverse the erosion of cultural capital, it is simple (at least in theory) to reverse bad policies. All we need to do is enact genuine entitlement reform and devolve all means-tested redistribution spending to the states. P.S. This is some great work by AEI, which follows on the stellar analysis that organization recently produced on income inequality. Makes me almost want to forgot that AEI put together a somewhat disappointing fiscal plan. While you are required to pay for Social Security and Medicare, according to the Supreme Court ruling in 1960, Fleming vs. Nestor, it was found that unlike insurance, you have no legal claim to anything for your contributions. Government can change or eliminate benefits at any time. Based on the fact that you are not retired yet, you’ll be lucky to get back what you put in. The FRA (Full Retirement Age) is now 66, for those born before 1954 and 67 for those born 1960 and after. Social Security was sold as insurance, but it is a welfare/safety-net program. The “Trust Fund” is a promise from government to government to pay itself back. Social Security is not welfare. You pay into Social Security all your life so that you will have it when you want to retire. You (usually) cannot or do not receive it until you reach 65. I have paid tens of thousands of dollars into SS and hope to live long enough to get it back. Other than that, Mitchell may have a few good points, though his charts are skewed by just showing numbers of people without considering population increases. BTW, Medicare, which most retired people get, is deducted from your SS check. You pay for that too. If I’m looking at the “Entitlement Dependence in America” table correctly, it shows that the population percentage receiving government benefits has increased faster than the population itself (rows 1 & 2, column 4)? If that’s true, this table speaks very loudly of America’s dependence crisis…very scary! on July 5, 2015 at 1:42 am Random | Tko je John Galt? Dependency continues to grow because of the disincentives built into our system. Those who potentially pay the highest marginal tax rates on income and benefits are the disabled and single mothers. The only way to disassociate the tax code from loss of benefits is to build a modified “safety-net” into the tax code, using a flat tax rate on all income, regardless of income bracket, plus a “prebate”, which cannot be lost by earning additional income. CATO did a study which showed the levels of support in different states. Hawaii was around $60,000 for a mother and two children. Most states targeted around 200% of the poverty level. Support probably breaks down 50/50 between the feds and states. With such high levels of support its no wonder that there’s no incentive to get a job. Instead, we should provide a prebate of 100% of the poverty level to all citizens. But, how would you pay for that??? Easy, replace the $1.4 trillion in current tax deductions with the prebate, which would cover citizens who currently pay taxes. Yes, there would be a dramatic shift in tax adjustment to lower income groups, since $10,000 means a lot more to someone earning $20,000 and paying a 25% flat tax than someone earning $1,000,000. 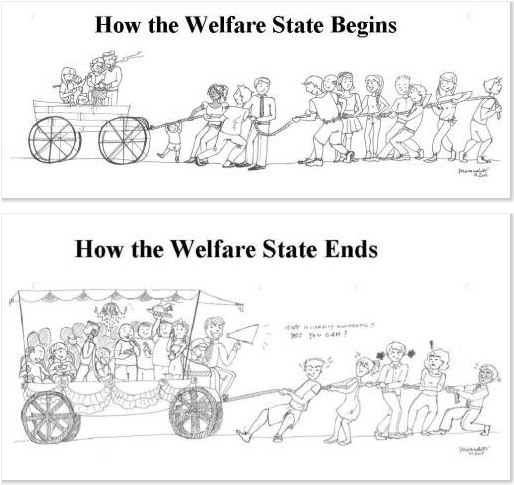 While state welfare would continue, federal welfare would be eliminated. Unemployment benefits could be cut as would disability payments. Disincentives disappear. Financial poverty for citizens disappears, war won. The biggest benefit would be progressivity in a flat tax system that would sell it politically. Bureaucrats would be bypassed and the economy would take off. Dan’s idea of closing federal welfare and sending the money to state bureaucrats does nothing to get rid of the disincentives.